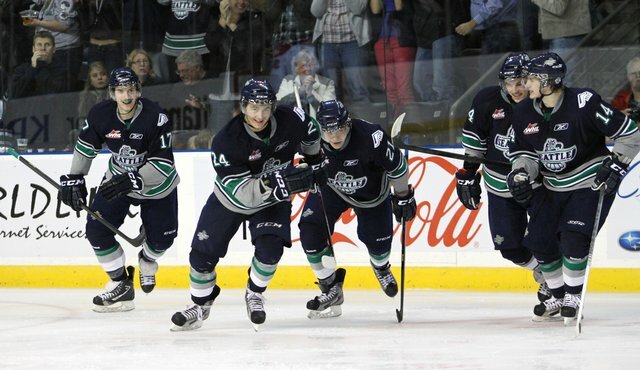 The Seattle Thunderbirds underachieved through the first half of the 2015-2016 campaign, finishing second in the U.S. Division, 3 points behind rival, Everett. The T-birds were almost unstoppable on home ice at the Showare Center, in Kent Washington winning their first nine games on home ice. The road caused the T-birds a bit of trouble, especially during their eastern conference road trip, which saw them play outside the friendly confines of the Sho for almost two straight weeks. Two third period breakdowns during the middle of that trip would set the tone; luckily they had a bit of their own third period magic against western conference foe, Victoria, which would be the start of a six game winning streak. Three players from Seattle were selected to represent their countries in the yearly tournament, the World Junior Championships, Which pits the best young hockey talent and future NHL stars against one another for two glorious weeks in December and January. Matt Barzal (Canada), Scott Eansor (United States), and Alexander True (Denmark) all made the trip to Finland for a chance at gold and glory. During their absence, Seattle would struggle, staying at around .500 and losing their grip on the top spot in the division. We grade the T-Birds a B-. The team is talented and should have prevented 3rd period break downs. By no means is the loss of Barzal, Eansor, or True an excuse; however, it is an explanation to how they got where they are at. Look for a turnaround in the 2nd 1/2 of the season. General Manager, Russ Farwell was busy during the international play, making a handful of deals to strengthen the Thunderbirds depth positions. Adding forward, Cavin Leth from Swift Current. Defenseman, Bryan Allbee from Kootenay. And finally, a blockbuster that would see Forward Jamal Watson, goaltender Taz Burman and a conditional 2nd round pick in the 2016 bantam draft for twenty year old veteran goaltender, Landon Bow. With these additions, Seattle has put themselves in the drivers seat for the number one spot in the U.S. Division, and quite possibly, a deep playoff run and memorial cup appearance. Mid-way through the season, the SSU staff would like to recognize the best players through this season. This native of Coquitlam, BC has played only 26 games but has secured 9 goals and 43 assists. As Barzal goes, so does the team as the offense basically runs through Barzal. Barzal is a future New York Islander having been drafted #16 in the NHL draft. The 6’5 Dane from Copenhagen has been a force for the Thunderbirds this year. Playing right wing, he has been one to reckon with as he has found net 17 times and pulled off an additional 24 assists. The defenseman from Ochapowace, SK has been all over the ice securing the backside of the rink. Although he is a shorter player, he plays squat and leverages oncoming traffic.